During last week’s CES, I had a chance to sit down with Motorola executives Steve Horowitz (SVP software engineering) and William Moss (director of corporate communications) to talk the year that was, what they took away from all that happened in 2013, their thoughts on wearables, and where we are headed in 2014. Our chat was a brief 30 minutes, but we managed to cruise through all sorts of topics including how they managed to update the Moto X to Kit Kat in under three weeks. I think you’ll notice a theme quickly emerging throughout that most of you will all be fans of: Motorola wants to do more of the same, which means continuing to provide value and choice with a stock Android experience anchoring it all. While they wouldn’t give up their roadmap for 2014 (don’t worry I tried to get it), I think it’s safe to assume that we’ll see MotoMaker stick around, new choices of materials will be a part of the scheme, new features will be added onto their suite of Touchless Control and Active Display, and prices will remain as good as ever. Question: As far as 2013 went, do you have a favorite moment whether it be Moto X or something else? Horowitz: It’s been very interesting to see people start to understand the value in doing less and not focusing on the spec wars and escalations of bigger screens, how many cores, etc. We really are pleased to have seen a shift – by no means are we done – and a momentum that’s really picked up with the products we’ve launched. X and G, not only do they have their legs under them, but we’re really pleased with how things are doing, Moto G in particular. It’s hitting a price point for performance that is really resonating with consumers. Everybody learns, so we’ve learned a lot, but we’ve learned that our core tenants of choice, value, and a nice pure, simple experience, really are starting to win over consumers. We’re very happy with that. Question: Goal going forward with core experience, to add on top of Touchless Control and Active Display? Horowitz: That’s exactly right. We started off a year ago and started from scratch. We’ve got years of legacy built up in our codebase – we’re getting rid of all. We’re literally going to start with a fresh drop of Android, and we’re going to simply add in the minimal things we need to be carrier, legally, and geographically compliant, which is a small set of things if you really boil it down, and then we’re going to add experiences that are complementary of Android, not in competition with Android. I know the [Android] team very well, I was an engineer there for 3 years when we first built it. I know the talent. I’ve always been a believer in a pure Android experience and the basics. I don’t think anyone’s ever sold more phones because their calendar had a better search box than the stock calendar or their launcher was just a little bit better. Instead of focusing on differentiating and competing with Android, we focused on things that are complementary to it and getting out of the way. That’s been one of these kind of virtuous circle things, that by taking that fresh approach with our code base we’ve been able to execute on upgrades at a pace I think nobody really expected. In addition to that, we’ve also done things with our experiences to make them market upgradable, Play store upgradable. And again, all these things are enablers for us to move really, really quickly. Moss: You were asking for single moments for us from the past year, and I think being the first OEM to come out with a Kit Kat device was a huge moment for us. As you may recall, our reputation, say a year, year and a half, two years ago – was such a turn-around in how we were able to approach the software experience and the upgrade experience. Members of the public feel differently about that, but there is definitely a core for whom that is super important and we had heard from a lot. Question: On that note, when you guys announced that Kit Kat was rolling out for the Moto X, it was under 3 weeks (19 days to be exact according to Horowitz), how did you guys do it? Horowitz: There really are two fundamental things that enabled us to do that. When I say “two things,” I mean two categories. One is this core Android experience that is just fundamentally more pure and less modified than anything we have ever done. And I would argue anything that any other OEM has ever done. So we started with a true pure Android approach. That is a facilitator, and that coupled with challenging the team to think really hard about making as few modifications as we possibly can enabled us. We then had to go to our partners – because it’s not something we can do on our own – we had to work with Qualcomm and Verizon, AT&T and Sprint and say, “Guys, let’s take a different approach to this. Let’s not treat this as business as usual where cycles happens in the following way with the following deadlines. Let’s rethink this from scratch.” And so they were great partners for us in doing that. As you said, it did require these two fundamentally different things to happen. But we proved to our partners as well as to consumers that it can be done. And I think we set a new bar and can be even better. Question: Moto X specifically – wood or natural backs – initially when you first announced them there were other materials. Still plans to do those? Horowitz: Yeah, I think you’ll see a lot of additional things in the domain of consumer choice, and new materials, and things like that in Moto X. I think one of the things you’ll see that’s consistent in this area is we also want to be careful and not try to do things that will lower the quality bar. We want to make sure we do fewer things really well. We started off with Bamboo so we could make sure – even then, Bamboo is technically not even a wood, as I learned myself – but each material has its own set of challenges both in terms of how you ensure the quality level, the manufacturing, the drop testing, the rigidity, the antenna. There are a lot of different factors. And then there is also the sourcing. We also want to make sure we’re responsible on the sourcing and making sure it’s sustainable and things like that. As we’ve learned – because again these are all learning processes for us – we have wanted to just do this carefully. But you’ll definitely see some other materials come into play. Question: MotoMaker – here to stay? Moss: Rolling it out from – you know it started on AT&T – to all the other carriers was a very big step for us in the last couple of months. That really helped to drive adoption of broad customization to a much bigger audience and we were really glad to be able to roll it out more. It’s going to be a big priority. Horowitz: The way I would characterize it is I would say it’s part our bigger story of consumer choice and options. We really expanded that beyond just carriers. Our direct to consumer channels and some of the sales we’ve had for some of the unlocked devices over the holidays were incredibly successful for us. Even if you look at Moto G – which isn’t a MotoMaker product – has choice. You can still have backs. It is arguably even more customizable than X because, my daughter can have 3 different backs – what’s her outfit look like today – “well I can use my blue back or my purple back or my yellow back.” Consumer choice is important, so I think you’ll really see us accelerate in areas like that. Question: Touching on price – Moto X is now $399 – is that another focus going forward? Initially, phones launching at a reasonable price point that people can get off contract? Horowitz: The way I would begin characterizing that is it’s about value to consumers. Really our goal here is very aligned with Google – we want to get phones and information access to billions of people out there that don’t have it. The first thing you have to do is get devices at a price point that can reach different kinds of consumers. Really what you’ll see us is us focusing on value. And that isn’t just value in terms of cheaper or lower cost phones, it’s value at every segment. Moto X we think is a great value at that price, and you’ll continue to see more of that with us. Question: Project Ara – how are things coming there? Horowitz: Things are going well – we don’t have anything really new to announce in that domain. As you might expect it has generated a lot of talk. Even internally we were surprised at the way that that’s resonated with – obviously not the broader consumer population – but it just goes back to choice. Consumers, ultimately there is not a one size fits all, and something like a Project Ara will allow people to specify not only at order time, but even dynamically. Like, I’m going out on vacation and maybe I want to rent a super high-end camera module or maybe I need to optimize for battery, so I put 4 batteries in the various slots so I can have extra long battery life. So consumer choice not just at product conception but depending on the individual use case is incredibly possible. Moss: I bumped into the technical project lead for Ara yesterday in the office before I left and had a quick chat with him. They are definitely making progress – stay tuned – there will be more to come. Then things got interesting for a moment when Moss asked me a question, basically giving me the power to tell them what they can do better. He wanted to know what it would take to get their product into my pocket as a daily driver, since I showed up to the interview with a G2 and Nexus 5 (Whoops!). Question (from Moss): You have a couple of different devices out here (on the table). Where do you see where we are at now? When you look at our devices and how they fit into the competitive environment – as somebody who follows Android closely – where are we good and not good? What would it take so that you are carrying our devices around as a primary device? Me: I basically told them to do more of the same, but that some people do still care about specs as much as the Moto X helped slow down the spec wars. I also told them that we focus a lot on cameras these days because the camera on your phone often times is all you have and it needs to be awesome. It’s the little things that make a smartphone great, since almost all smartphones are good these days. And last, I told them that the Moto X (with Bamboo) is actually my daily phone, but that I was using the G2 in its place for the extra battery life while hotspotting during CES. They joked about me being one of the few that are buying Bamboo. We then moved casually onto Moto G. Both shared some thoughts. Moss: You also asked about things from the past year that had been big moments for us and I think the other thing (other than software upgrades), when we put G out and we saw the reception to it – we were optimistic about the product and we felt that there was a good strategic case for it – I think we were pleasantly surprised by how positive the reaction to it was from reviewers but also just from people who appreciated somebody putting out an affordable phone that wasn’t crappy. And you know, the response from consumers has been very good and we have been very, very happy with that. I think that was a big lesson for us – Steve talked about choice before, in terms of how we bring different kinds of choices to people and I think that formed very much our decision to do off-contract Moto Xs for $399 and give people more choices around value and around options that aren’t driven by contracts. So that was a very big deal for us. Horowitz: I think Moto G really shows – you talk about specs, and there obviously is as you say, is going to be core group of folks [who cares], which is fine, great, because the world needs variety – but what Moto G, we’re hoping it shows, is that by doing less, by having a more pure experience – again this is part of my Android championing part that says the product can do great things if you don’t get in its way. And that’s what we think we have done with Moto G. We have created the kind of experience that is – there are still some great Motorola experience stuff in there – but it’s a pure Android experience on a phone and it shines, given the relatively [lower] specs. I would put even the Moto G up against some of the highest end smartphones today and I would challenge you to tell the difference in many cases. I think thematically you’ll see just more of the same which is, we want to continue to do fewer things and do them very well. We want to offer things that are of value to consumers and increase the accessibility of the internet. We want to have more and more choice. We want to build things that we feel have resonated. We have done a lot of things over the last year, made a lot of changes, and we have been surprised in a lot of cases. Like anybody will learn with what resonates with consumers we’ll see more of – I know I’m being very generic here – nonetheless, themes of choice and value will be accelerated. Question: Wearables – the hot topic right now – you guys at one time did the MotoActv, so any plans to think about going back in there? Horowitz: As you can imagine, we’re not going to announce anything, but really it’s an area that we’re [thinking really hard about]. When we do something we want to make sure we are careful about and don’t want to just do it for the sake of doing it. Clearly it’s an area that we think is resonating with a certain subset of consumer. Even though the bands and the fitness part is a broad consumer thing, I think having a more interactive experience with wearables is still a much smaller market as people learn to integrate. And that was our chat! As you can tell, they weren’t about to give up dirty little secrets or specific plans for the future. 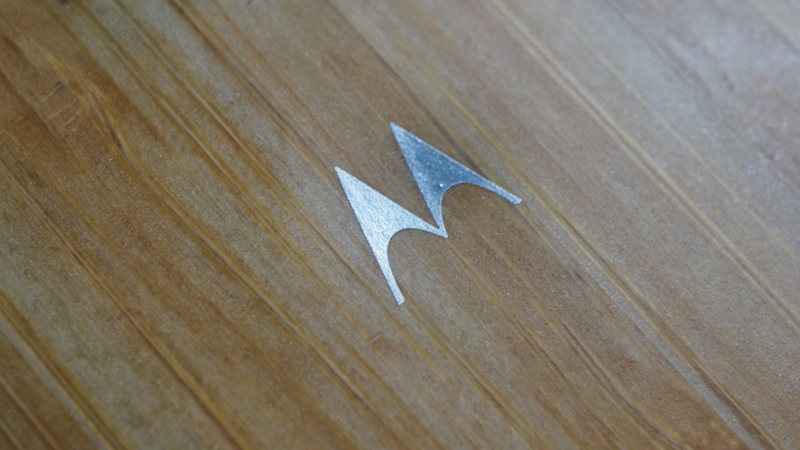 However, if you were a fan of what Motorola did during 2013, I think you should be excited to know that they are going to continue to focus on using stock Android, giving us great pricing (hopefully out of the gate this time), bringing customization, looking into wearables, and updating phones faster than they did last year.